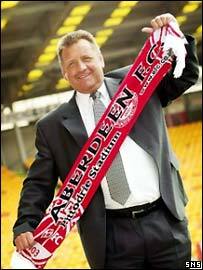 Jimmy Calderwood has been unveiled as the new manager of Aberdeen and will be joined by assistant Jimmy Nicholl. "I'm very happy to be here, although I have to say it was a wrench to leave Dunfermline," said Calderwood after signing a two-and-a-half-year deal. "It is not going to be an easy job but I believe that in time Jimmy Nicholl and myself can take the club back to where they want to be." Calderwood and Nicholl had been together at Dunfermline for four years. Aberdeen sacked previous boss Steve Paterson on Monday and appointed Willie Miller as the club's new director of football. "When someone like Aberdeen comes in for you it is an attractive prospect and I was impressed by Willie's plans for the club," Calderwood added. A compensation fee was agreed between the clubs on Thursday and talks have been concluded swiftly. Miller thanked Dunfermline for their co-operation throughout the negotiations and hailed Calderwood's arrival as a great day for the club. "In football terms a week can be a long time and this one has certainly been hectic," Miller said. "We have conducted ourselves with dignity throughout and have to thank Dunfermline for their help. "I have long admired Jimmy's ability and the style of football he plays, so I am confident he is the man to take the club forward." Dunfermline chairman John Yorkston was less than happy, however, with Aberdeen's approach and the loss of his management team. "The request from the management arising within hours of our cup final appearance has both surprised and disappointed our board and despite strenuous efforts it was obvious to us that minds had already been made up and would not be turned," said Yorkston. General manager Jim Leishman said the Fife club would take their time in naming a new boss. Davie Hay has been installed as the strong favourite to take over the East End Park hotseat. The Livingston boss will be out of contract on Monday but Leishman insists there will be no immediate appointment. "There will be loads of speculation but we will take our own time to decide," said Leishman. "This is a great job for somebody. "Davie Hay, Terry Butcher, John Robertson, Eric Black, John Gorman, Martin O'Neill, Alex Ferguson, Claudio Ranieri, we'll have a look at him, and everyone will get linked." Calderwood had taken a pay cut in February as the Pars came close to moving into administration. He steered the club to a fourth place finish in the SPL and the Scottish Cup final this season.